Well, it seems I’ve just accidentally celebrated Halloween. For some reason I spent last night reading about forms of capital punishment on Wikipedia, and I’ve come up with some interesting things. We’ve all heard the term coup de grâce. Some of you probably even know how to prononounce it properly. It’s not as close in meaning to tour de force as I’ve always thought; it’s actually best known as the single shot fired by an officer commanding a firing squad, if the first volley from all those rifles isn’t actually immediately fatal. To be “shot at dawn” obviously comes from the tradition of firing squad executions at first light. Less obviously, and arguably more gruesome, is the origin of the Catherine wheel. Nowadays, they’re fireworks displays; giant spinning wheels with sparks or flames and otherwise pretty stuff coming off them. They used to be known as breaking wheels, which the condemned person was tied to by rope, and then beaten to death with a club. While spinning around, so the executioner wouldn’t have to walk around them in a circle. The original Catherine wheel was so named because a Saint Catherine of Alexandria was meant to have been executed on one. Here’s a nicer tale: People used to be so freaked out by the idea of being buried alive, a Belgian fellow invented a device that watched for movement of the corpse’s chest in the coffin, and would trigger alarms and raise flags above the grave if such a thing occurred so the prematurely interred could be rescued. This was back in 1897, though, so there were no computers or anything to do the job for us; undertakers were hired to watch the graveyards at night for these signs of life, and so came into being the graveyard shift. I don’t care if that’s actually vandalism or something, that’s a bloody cool story. The death of a thousand cuts sounds almost pathetic in comparison to the gas chamber or lethal injection, until you connect it with its more accurate name: Slow slicing, or Ling Chi in the Chinese. Basically your body would be very slowly and carefully hacked apart – fingers, toes, ears, nose – in order to desecrate it. Confucius say body alteration is unfilial practice, and I wholly agree. Creepiest part of that article: Your family having to pay a bribe to the executioner to supply the coup de grace. To hell with being evil enough to deserve it in the first place, I reckon. I’ve got nothing to say about scaphism, though. Seriously, don’t even read that article. It goes beyond cruel and unusual. That’s all I’ve got. Hope you ate dinner before reading this. you could squish the flying spiders with the pogo stick. In honour of Intel releasing BIOS version 0093 for my DP45SG, I pulled an all-nighter devising practical ways to actually upgrade to it. And then, at the end, discovered it still didn’t fix my issue – my 4870×2 is still a paperweight. In retaliation I decided this week’s theme was retro gaming, and discovered 3D Realms had released Halloween Harry (aka Alien Carnage) as freeware. 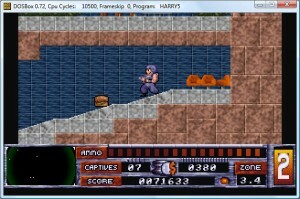 All four episodes (two were released as shareware). ‘where are they now?’…. keen was morbidly obese by the age of 25, but has since turned his life around while promoting the pogo-stick exercise system. I’m sitting at my desktop computer. Before me are my keyboard, my mouse, my monitor. Behind me sits my broadband modem, my backup hard drive, my wireless access point, and my laptop computer. My printer’s over there *points* and there’s a stack of compact discs on the floor just *points* there. I am completely bored with every word in the above three sentences. “Computer” is such an old word, despite its most common meaning. It’s even more generic than calculator, which is a pretty stock standard little device that hasn’t changed its appearance in a number of years. We still talk about personal computers (duh), desktop computers (instead of room-sized electronic caves), laptop computers (instead of desktops), and keyboards (it’s a board of keys. We get it now). Automobiles are just cars now, mobile telephones are just phones… why can’t computer stuff get nice modern names too? I think “Wifi” was a good start, but it’s such a silly word nobody took it seriously, and so we still sell wireless access points. We don’t even call FM radio “wireless” anymore; we need to move on and start calling it RadioLAN (“W-LAN” is awkward to type and say). This is a more annoying problem than you think – have you ever tried to explain the difference between wireless networking and wireless internet without spontaneously combusting? Desktops and laptops are okay – use both words in the same sentence and people can separate the two ideas in their heads. For some people, though, they’re still just “computers”, and calling the desktops “towers” offends my love of small computers. One term you may not have heard is deskside, which is vastly underused and IMHO outrageously cool. Here’s a sign computer nomenclature is far behind that of cars: Top Gear throws the words “supercar” and “hypercar” around like confetti, and they do it while talking about unbelievably awesome things. Meanwhile, a supercomputer is still something that takes up a room and predicts the sodding weather for a living, and hypercomputers are so unexplored, Wikipedia still describes them as hypothetical. I dunno what to do about modems. I instantly hate on sight people who talk about input and output (unless they’re discussing RAID 5), or the super information highway (even if they’re being ironic). We should all be calling them gateways, and better distinguish between those, and routers, and wireless access points, so when we make all-in-one devices it doesn’t take half an hour to explain what they actually do. “CD” is alright, and “DVD” is still cool, but compact discs aren’t compact anymore, and if you still refer to computer stuff as “digital” then you’re as irrelevant as the word analogue. Bluray and Bluetooth are stupid words too; is anybody else as bored of blue as I am? I bought a new LED fan for my desktop this week, and it makes my room glow purple. It’s divine. We seem to be over lasers now, probably because the general population’s realised we can’t make super burny handguns out of them (and the really cool ones are banned in my country, because idiots were pointing them at helicopters). I’m happy with mice for the time being – mine would look like a stealth car, if it didn’t glow orange in places – but keyboards give me the shits. It’s 2008, and we can’t custom-order nice looking keyboards with our own exact layouts and shapes and functions? I’ve looked into this, and it seems if you don’t like what Logitech or Microsoft make, you’re completely screwed. Custom, made-to-order keyboards go to entities like airlines and point-of-sale outfits that need lots and lots of buttons that do weird non-normal-computery stuff, or people with serious disabilities. And they look like 20 year old model M boards. Yes, I’ve seen the steampunk keyboard. No, I’m not impressed. I want a normal keyboard without the completely unused numberpad, but I don’t want a trendy “compact” keyboard that forces you to press a laptoppy Fn key to do normal everyday tasks. Gaming keyboards are sometimes pretty cool, but usually go in completely the wrong direction in terms of size (you could use the Logitech G15 as a land bridge between here and Saturn). I have built myself a new gaming PC. My ATI 4870×2 was a pain to order, and holy crap is it a pain to install. I’ll take it seal clubbing when I get bored of gaming. My motherboard doesn’t support my 4870×2. I bought an Intel board with reliability in mind, a complete crushing irony you can read about here. This is worth clarifying and repeating: Do not buy a DP45SG and a 4870×2 until I say so. I’m waiting for another BIOS update that’ll make everything better. Meanwhile, the power supply I picked up ran perfectly for ten minutes, and then I mailed it back to exchange it for a working one. Don’t assume modular power supplies are awesome. Anything is only as good as its weakest link, and if you forget to plug the *other* end of the cable in (or that plug is ever-so-slightly off and thus impossible to attach without removing the power supply from the box anyway), things don’t work too well. As an alternative to the Cooler Master Stacker, the Thermaltake Armor and the Antec Nine Hundred, allow me to suggest the Lian Li PC-A16B. It’s made of aluminium, it looks like an industrial refrigerator, and is the perfect case for a PC you want to name after Batman. Today’s new surprise: the recent grinding to a halt thing it’s been doing is not a sign of underdeveloped storage drivers, but that my 1TB hard drive is dying. I’m fighting my instinct to rush out and buy the most awesome mirrored RAID setup my money can lay its hands on; I’m going to stand by my intention of not spending money to back up data everyone else already has anyway. Customer: Hi, my laptop has a problem, can you look at it? Me: Sure… oh, it’s a blue screen of death? That could be hardware. We’ll need to book it in and look closely at it… did you bring the power adapter for it? Me: …the power adapter. The big power cable that charges the battery. Customer: Oh. don’t you have one? Me: Not for every single make and model of laptop, we don’t. And definitely not (glances at laptop) for Vaios. Fair enough, we’re a computer store. We do occasionally order in and sell laptop power adapters, and we have one or two universal adapters for our own use, but it’s easiest for everyone if customers bring their own in. Customer: Hi, I’m having trouble with my printer. I’ve brought my computer, can you plug it in and take a look? Co-worker: Sure, have you got the printer with you as well? Customer: No… don’t you have one? I can completely understand people being ignorant about how their electronic possessions work. I’m a great example myself – I fix computers, but I couldn’t tell you what volts and electrons and transistors are for. I still think the microwave oven is some kind of voodoo trick aliens gave us to make nachos at 3AM. But come on, would you book in your car for a service and deliver them the parcel shelf and the seat covers to examine? Are people really so afraid and ignorant of their computers they don’t even have the basic knowledge to identify what components need to be present to figure out why they can’t print? Not that I’m calling her ignorant. I’m sure she’s just too busy to sit down and spend time learning about the device she places so much trust in. This is my NB6W. 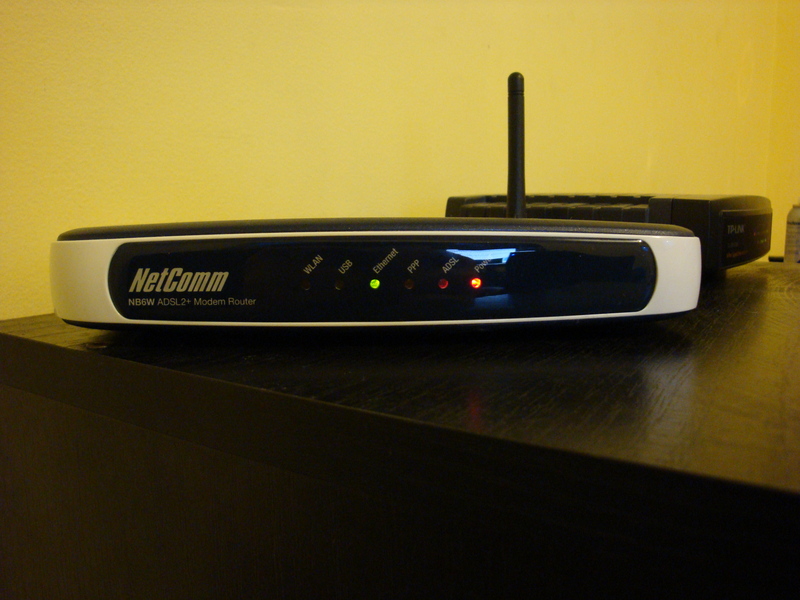 It’s a one port ADSL modem with wireless LAN. This coming Tuesday will mark its 3rd return to Netcomm for purposes of warranty. We were selling a lot of NB6Ws at work, so when my WAG54G died during a storm, I figured I’d get one and familiarise myself with it so I’d be better at supporting it over the phone and such. What I’ve actually accomplished, though, is to become familiar with the various ways in which these things become faulty and die. By far, the most common is that they’ll suddenly stop working one day, you’ll turn it off and on again, and all you’ll get is a red power light, and the USB and Ethernet lights will stay solid green. Plugging and unplugging anything else – phone line, network cable – makes no difference. If you see an NB6W doing this, it’s gone. We’ve also had a couple that just refuse to get line sync whatsoever. We’re aware of incompatibilities with telephone exchange hardware – apparently NB5s won’t work on Optus ADSL2 – but that doesn’t seem to be the issue. This one is new. When I woke up today, i had every light but USB on (I don’t use it as a USB modem), the power light was red, and the network light was flashing. Even when I unplugged the network cable. It’d locked up hard; which lights were on was completely irrelevant to what was actually plugged into it, and I definitely couldn’t see it on the network. I cycled power to it, and now it’s as you see it above. Red power light, ethernet light comes on if there’s a network cable, and that’s all. Basically it’s a blinky doorstop. I’m still trying to decide what to replace it with. We also sell the NB6+4W at work – the four port version of mine, which must be different enough inside to not have the same problems because we’ve never had a single one back – and one of those would definitely solve my issues. 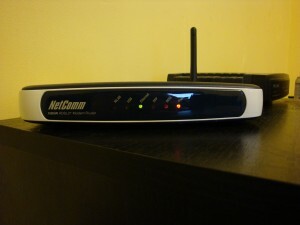 At the other end of the scale, I’m eyeing up Belkin’s N1 Vision router, that insane thing with a D-pad and LCD screen. I’d pair that with a Billion 7300 or a plain NB6 – again, same as mine but without wireless, and again we’ve never had a single one back – and rely on the N1 for routing and wireless networking. That’s all speculation, though. It’s the long weekend, and I’m stuck without broadband. I still have internet access, though. Of sorts. This is my W800i. It’s a GSM mobile phone with Bluetooth. 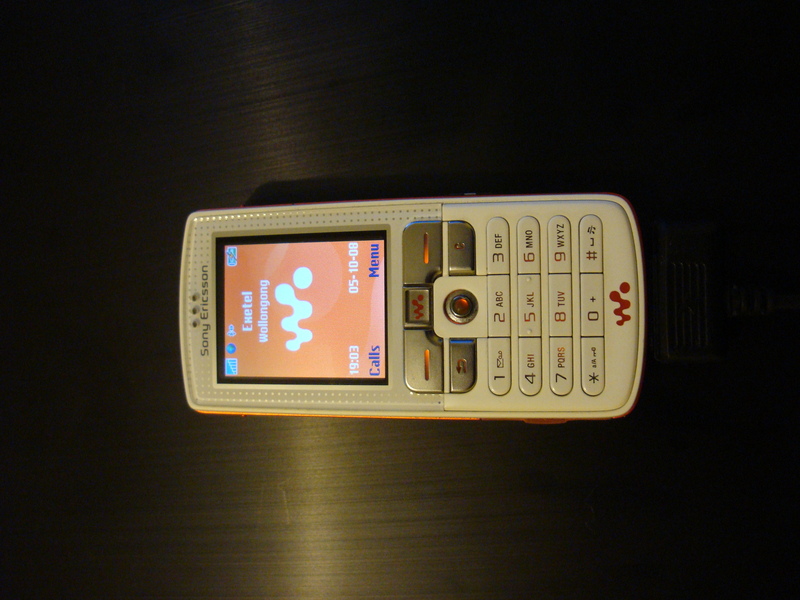 It’s not 3G, but it does support GPRS, and is capable of running Opera for very slow web browsing while out and about. It’s also, if you can connect it to a PC, a GPRS data modem. It’s no speed demon – OzSpeedTest reckons I managed five whole kilobytes a second, so calling it a “broadband” speed test is a bit of a misnomer – but it’s rock solid stable and reliable, and is more than enough for MSN, light web browsing and blogging. This is a snap to set up. Pairing a Windows PC with a Bluetooth mobile phone will automatically install it as a Bluetooth dialup modem. If you have a USB data cable, it’ll detect as a USB dialup modem. 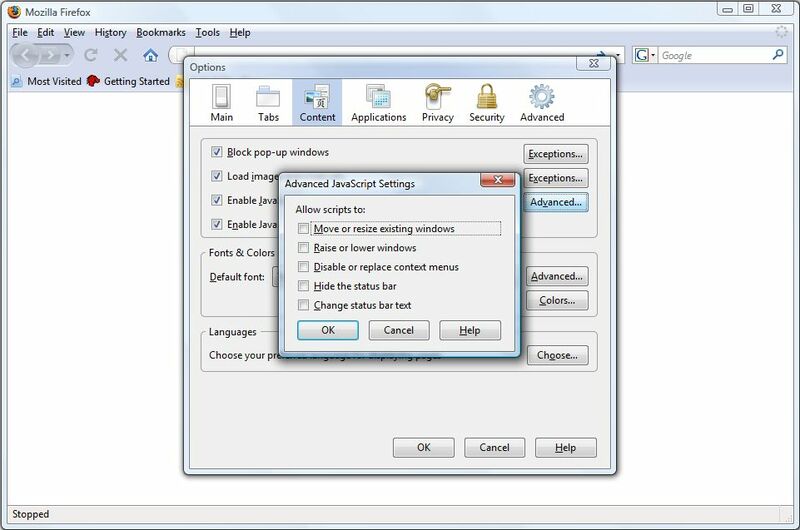 Then, create a dialup connection in Windows, with your phone as the modem. The number to dial is *99# and you can leave the username and password blank. When you start ‘dialing’, your phone will behave like you’ve just opened its own browser and told it to load something off the net. Whether or not you can take and make voice calls while you’re using GPRS depends on what kind of phone you have. I think my phone downloads SMSes via GPRS anyway, so Voicemail could let me know I’d missed a call, but calling them back dropped out my net access. I think my W800i is a class B, and the GSM network can tell, so it didn’t interrupt the GPRS connection to allow the call though. Plenty of older computers die not because of overheating, or power surges, or your nephew fiddling with them, but because of faulty capacitors. Wikipedia dubs the phenomenon the “capacitor plague“; at work, we just point into an open PC and say “blown caps“. 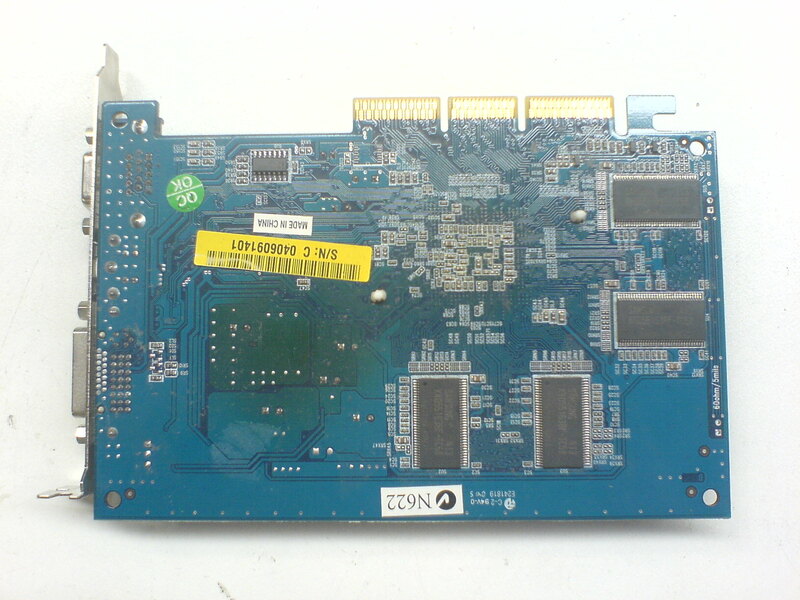 Here’s a video card I pulled from a machine at work today. It’s not hugely obvious – I actually missed it myself at first glance – but zoom in and you’ll see the two leftmost caps are actually bulging at the top. This, frequently, isn’t completely fatal to a bit of computer hardware; I see plenty of computers that seem to work just fine with several leaky capacitors, and obviously this doesn’t just happen overnight. Note the green discolouration. That’s heat damage, from a very unhappy transistor. This was not the only problem with that particular computer. It also had faulty RAM, which combined with the video card, made it very annoying to troubleshoot. 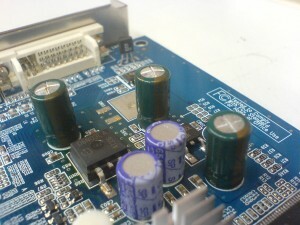 All electrolytic capacitors will eventually wear out this way, but the story surrounding the current plage involves industrial espionage and theft of formulae for new, untested capacitors. The competition put them into production early, sold them to millions of people, and a few years later tons of computers and DVD players and such just started dying. Soltek motherboards were notorious for these early-death-prone caps; rumour has it they actually went under because of the losses they took honouring warranty for all those dead boards. 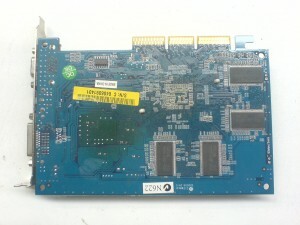 Nowadays, hardware manufacturers offer “solid caps” as a premium feature. They cost a bit more, but are supposed to last longer than normal caps; it’s a peace of mind thing. I personally don’t see the point, because I reckon if you care enough about your hardware to know about bad capacitors you’re already going to spend the money on quality stuff in the first place. You’re also likely to upgrade your whole PC before the age of any of the components grows into failure territory, so you’re probably not the one who’s going to have to deal with it anyway. I guess solid caps look nicer, though, and on that basis I’d spend the extra $20 if given the option. I’m that kind of geek. It’s worth knowing about, though. The computer at work beeped like it couldn’t detect a video card at all, it’d failed that completely. A motherboard with bad caps may not be completely healthy or completely dead; it’ll be wandering some thin line in between. You don’t want something like that responsible for your family photos or your essays, now do you?